Where to find Meadville hotels near an airport? Where can I find hotels in Meadville that are near tourist attractions? For those travelers hoping to find accommodations near Meadville, there are a number of options. The middle of Meadville offers 6 apartments and hotels within 0.1 kilometres (0.06 miles). 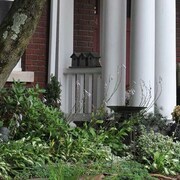 The Mayor Lord's House Bed and Breakfast, is a great option for visitors as it the most centrally located lodging choice in Meadville. Hoping to identify more economical accommodations? You could explore the Mayor Lord's House Bed and Breakfast, Days Inn Meadville Conference Center and Econo Lodge. 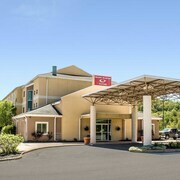 The Hampton Inn Meadville can be found 4 kilometres (2 miles) from the heart of Meadville. 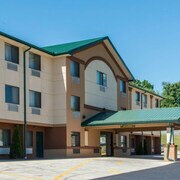 Or, alternatively, the Comfort Suites Edinboro is located 25 kilometres (17 miles) away. 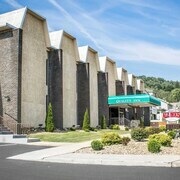 Two more places to stay worth looking into include the Quality Inn and the Holiday Inn Express Meadville (I-79 Exit 147a). For those keen to see some more of the rolling hills and tablelands common in this part of the world, you could also spend a few days in other parts of Western Pennsylvania. No matter if you join in with the common local activities, for example hiking and shore fishing, or travel around to see the sights you will be able to find suitable hotel accommodation in the region. 55 kilometres (34 miles) to the north of Meadville you will find Erie, where you can find Splash Lagoon and Millcreek Mall. Should you wish to stay in Erie, check Expedia's booking pages for the latest deals at the Sheraton Erie Bayfront Hotel and Downtown Erie Hotel. 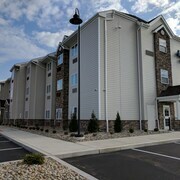 Alternatively, you could consider staying at Hermitage, 50 kilometres (32 miles) to the southwest of Meadville, where you'll find the Quality Inn and Red Roof Inn & Suites Hermitage. If you're staying in Hermitage, be sure to check out the Webb Winery and Reyers. Consider spending a few hours rubbing shoulders with fellow sports enthusiasts at a local game. You'll find Eastwood Field 70 kilometres (43 miles) to the southwest of Meadville. 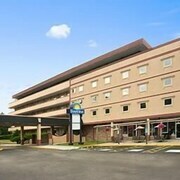 Sleep right near the action at the Fairfield Inn Marriott Niles or the The Avalon Inn and Resort. Venango Regional Airport is a logical option for getting to Meadville. It is 40 kilometres (24 miles) away. Quality Inn & Conference Center is close by. What are the most popular Meadville hotels? Are there hotels in other cities near Meadville? What other types of accommodations are available in Meadville? Explore Meadville with Expedia.ca’s Travel Guides to find the best flights, cars, holiday packages and more!